I got around early this morning because I had to be in West Alabama for a meeting which meant road time. I think the chickens were still sleeping when I eased in the pen and dumped the feed in the feeder and swished out the waterer. 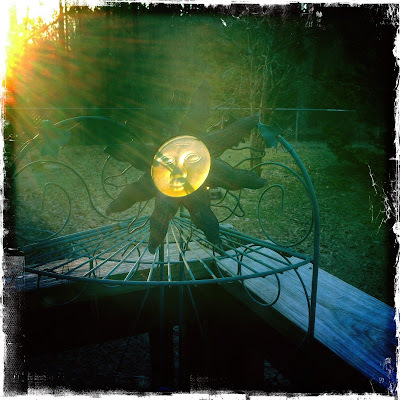 A pike of sunlight pierced through the underbrush and highlighted a piece of yard art Jilda had placed on a stand in the corner of the back deck. The light wasn't that good, but I snapped a photo anyhow because I knew I wouldn't have an opportunity to get many pictures today. It was a productive day, but tonight I am one tired camper. I hope your Friday is the gateway to a remarkable weekend. Cool shot...the sunrays on the sun sculpture...sweet! Hope your weekend is great. I'm planning a lot of throwing out and cleaning out since the temps are suppose to only be around 10de. Good excuse to stay inside! I like how the sun shines on the sun. Oh wait, yaya already said that...well we have a consensus. Good morning, sunshine. That sunbeam makes me smile. I love the yard art ! I get the feeling you are going to enjoy the weekend ! What an awesome piece of sun on sun work of art and a mouthful too. Have a great weekend too. I woke up tired this morning so I'll ease up on myself and will wait till I'm in better form to tackle the job I was going to tackle today. I hope you catch up on your rest and have a terrific weekend. At first I thought there was an arrow sticking from the center of the face. I wonder if that has a dark meaning about my psyche.